This video is a marvelous bit of fun, one that speaks to some issues that exist within the Jewish community. In one sense, it serves as a parable of the conflict between orthodox and reform, literal and liberal, fundamentalist and metaphorical approaches. In another sense, it reflects the conflict between east and west coasts Jewish communities, specifically between New York as an old world, elitist center where Jews remain relatively traditional and Jewish identity is very strong and overt, and Los Angeles as the new world where people feel free to leave their old identities behind, and disguise who they are. Someone once said that in New York, everyone is Jewish, even the non-Jews, and in LA, no one is Jewish, not even the Jews (I suppose it was a New Yorker who said that, though). Noble Savage Productions and Sonny Boy Studios are thrilled to announce that we have completed our short comedy "A Reuben By Any Other Name." The film takes a humorous look at the differences between Orthodox and Reform Judaism played out in terms of the differences between the New York and Los Angeles versions of the Reuben sandwich. Brilliant performances are provided by an ensemble cast of familiar faces from film and television - Jasmine Anthony (Stephen King's 1408, Commander in Chief), Anita Barone (The War at Home, Daddio), Paul Ben-Victor (In Plain Sight, Entourage), Larry Cedar (The Crazies, Deadwood), Pamela Cedar, Alanna Ubach (Hung, Legally Blonde), and Matt Winston (John from Cincinnati, Little Miss Sunshine). Are you an Orthodox or Reform Reubenite? Watch the film and find out! As Reform Jews, we are not obligated to keep kosher, although we are free to choose to do so, as strictly as we would like, or to pick and choose which of the kosher laws to observe and which to disregard. For many of us, keeping kosher is not a religious obligation, but we may still have certain cultural and aesthetic tendencies towards not mixing meat and dairy, or not eating trafe. For me, as far as the Reuben is concerned, I'm pretty much with the little girl. The delis I remember from when I was growing up, including the Pastrami King in Kew Gardens, Queens, which was often referred to in the columns of famous New York Daily News columnist Jimmy Breslin, were kosher, and something like the Reuben sandwich was never on the menu. My first encounter with it was in Greek diners in New York City, although I later saw that some Manhattan delis served it as well. But I really don't see how the Reuben could be a Jewish sandwich, no more than the Philly cheesesteak, or your basic, run-of-the-mill cheeseburger. It's just not kosher! If you have a similar encounter with the Reuben, or a different one, well, feel free to share in the comment section, we'd love to hear about it! And so, the lesson is, both sides are right, both sides are wrong, and no one knows where the truth lies, so why don't we all just get along? And have a good laugh at ourselves in the process? At our annual Adas Emuno fundraiser and cantor's concert this past May, Fiona Arang, who organized the event, asked me to prepare a little talk about our history, and I thought I would post it here. The talk concludes with a call to restore and install the stained glass windows from our original synagogue window, and photographs of the windows are included below. Seven score years ago, our fathers, and our mothers, brought forth, in this State of New Jersey, a new congregation, dedicated to the principles of family and community, spiritual partnership and the universal kinship of the human race. We are here today, one hundred and forty years later, because of the vision, the commitment, and the dedication of those pioneers from Hoboken. They could have chosen to do nothing, to spend their time working and entertaining themselves, as so many of us do today. But they realized that a life lacking in the spiritual dimension is a life that is truly impoverished and incomplete. And so, they chose to keep faith with Judaism as a tradition. And as it is an evolving tradition, they chose to move forward as part of the Reform movement, so that Jewish life could take full advantage of all that the modern world has to offer, and so that our religion could remain open and flexible, to meet the challenges of changing times, to continue to adjust to rapidly changing circumstances, to remain relevant in a world that the founders of our congregation would have difficulty recognizing. Just consider that back in 1871 there were no automobiles, or airplanes, no satellites or astronauts. Cities were not wired for electrical power, and indoor plumbing was still a pipe dream. There were no motion pictures, or sound recordings, no radio or television, no computers or internet. There were no vaccinations, no pasteurization, no x-rays, no penicillin, no organ transplants, no knowledge of DNA, no cloning. In 1871, the nation-state of Germany was born, an event of some significance to the founders of our congregation, who were all German immigrants, and this brought the Franco-Prussian War to an end, with France's surrender. Across the Hudson River, it was William Tweed who surrendered, to the authorities, his arrest bringing to an end his reign as the Boss of Tammany Hall. To our North, British Columbia joined the Canadian Union in 1871, while the United States itself was still healing from the wounds of the Civil War, in the midst of the Reconstruction Era, under the presidency of Ulysses S. Grant. If you think about it, our congregation was founded at the same time that the modern world, the world that we know, was struggling to be born. The world of the founders of Adas Emuno seems so far removed from our own, and yet 140 years is but a blink of an eye in the history of the Jewish people, which originates about four thousand years ago. The Diaspora began over two and half millennia ago, with the destruction of the First Temple in Jerusalem, and we fully became a nation in exile almost two thousand years ago, with the destruction of the Second Temple. We commemorate both of these events on the fast day of Tisha B'Av, and also on that day in 1492, half a millennium ago, that the Jews were expelled from Spain. That same year, the first Jews arrived in the New World, sailing with Columbus, and it was the exiled Sephardic Jews of Spain and Portugal who formed the first Jewish communities in the Americas, beginning in Brazil in the 16th century. When they later were forced to flee from persecution, Jewish refugees from Brazil established the first Jewish community in North America in 1654, again, just across the Hudson, in New Amsterdam. The founders of Adas Emuno were Ashkenazi Jews, part of the great immigration of over 200,000 German Jews to the United States that took place between 1840 and 1880. Before the 1840s, most American Jews were Sephardic, including the Revolutionary War hero, Haym Solomon. And as you know, the American Republic was founded on the principles of equality and religious freedom, and in fact our founding fathers looked to the Torah as a guide in drafting our constitution, looked to ancient Israel as a model of a nation founded on human rights, unalienable rights, that is, rights that cannot be revoked, not even by democratic degree, because they are the natural rights of all human beings bestowed upon them by our Creator. Over in Europe, things were more complicated, but the German Jews who came to the US in the 19th century brought with them their own experience of the Enlightenment, emancipation, and reform. During the 18th century, the German Jewish philosopher, Moses Mendelssohn, one of the leading figures of the Enlightenment in Germany, argued for the separation of church and state, and acted as a mediator between German and Jewish culture. He is remembered for his formula for re-formed Jewish life: "Adopt the mores and constitution of the country in which you find yourself, but be steadfast in upholding the religion of your fathers, too." The French Revolution is seen as the starting point of Jewish emancipation in Europe, following the example of the American Revolution, as the Declaration of the Rights of Man of 1789 provided the general principle of equality independent of "religious opinions," and in 1791, the National Assembly granted full citizenship to all Jews within French borders. The willingness of individual Jews to swear loyalty to the French Empire was not sufficient for the Emperor Napoleon, who in 1806 called together a National Assembly of Jewish Notables to answer twelve questions about Judaism, and later assembled the "Great Sanhedrin," which was the name of the Jewish governing body that existed before the destruction of the Second Temple. Finally satisfied about Jewish loyalty, Napoleon pronounced Judaism one of France's "official" religions in 1808, although he also enacted new economic and residential restrictions on the Jewish people. Before his ultimate defeat, Napoleon had conquered the states of Germany, and his imperial rule brought with it emancipation for the German Jews, which in turn led to the formalization of the Reform movement, initiated by Israel Jacobson, Abraham Geiger and others in Germany in the early 19th century. The first Reform temple was built and dedicated in Hamburg in 1818, and the German Jews that immigrated to America brought the Reform movement to the western hemisphere. The first Reform congregation in the United States was known as "The Reformed Society of Israelites," organized in 1824 in Charleston, South Carolina, and as this was a southern congregation, it should come as no surprise that the Society was founded by secession, from another congregation. And it was here in the United States that the Reform movement flourished, especially following the great wave of 19th century German Jewish immigration. It was out of this confluence of events that Congregation Adas Emuno was born. The congregation first started meeting in Odd Fellows Hall, and what that says about the abiding character of our community I will leave unsaid. After a few years, we moved to a larger building in Hoboken, and in 1883 we erected a home of our own, a synagogue that, while no longer home to a Jewish congregation, still stands today and is considered a historic landmark, the oldest synagogue building still standing in New Jersey. Within a decade of the completion of the synagogue, the congregation had grown from 33 families to over one hundred, close to the size it is today. Our congregation thrived in this location for the first half of the twentieth century, but during the postwar era, population shifts made it less and less feasible to maintain a Jewish center in Hoboken, and in 1974 we moved to our present location in Leonia, purchasing a building that was formerly a Lutheran Church, the Lutheran denomination having its origins in Germany as well. Over the years, our congregation has evolved demographically, not only in moving north, but also in moving beyond the original make up of the congregation as almost entirely German, so much so that the minutes of early board meetings were recorded in German. Today, our congregants include Ashkenazi Jews from many different points of origin, as well as Sephardic Jews and Jews of middle eastern origin, and we are also blessed with many members who are Jews by choice, and we remain open as well to non-Jews who wish to take part in Jewish life. But as much as things have changed, some things have remained the same, including the sense of warmth and affection that everyone notices when they first encounter Adas Emuno. We have been able to maintain our identity as a small, intimate congregation where everyone gets a chance to participate, to be an active part of religious observance and community activities. We have remained an open and inviting group, one that is distinguished creatively, artistically, and intellectually, one that retains that pioneering spirit of 1871, and that commitment to enlightenment culturally, and spiritually. Ours is a congregation that is truly modern, truly Reform, truly American. And here we are today, at a time of transition. This is our cantor's farewell concert, we are all grateful for her many years of service to Congregation Adas Emuno, we will miss her golden voice and more importantly, her golden heart, and we wish her the best for the future. We have been blessed, over the past 140 years, with many gifted and dedicated spiritual leaders, rabbis and cantors of outstanding quality, and we give thanks for the blessings that we will continue to receive in the years to come, as we prepare to welcome our new rabbi and student cantor. We have also been blessed by good neighbors, by Leonia's conservative congregation Sons of Israel, who have closed their doors, but given us a gift of a beautiful ark that we will be installing in the near future. In this way, we will carry on a bit of their tradition here in Leonia, along with our own. And as we look to the future, I think it worthwhile to note that our synagogue building was erected in 1942, which means it will be 70 years old next year. In other words, it's no spring chicken, and I think we all know that it needs some sprucing up. We need to embark on a capital campaign, to raise money to make it the kind of sanctuary that we can all feel proud of. And as part of that effort, we want to restore and install the stained glass windows that Adas Emuno congregants brought with them from Hoboken to Leonia when the congregation moved. These beautiful windows have been stored away for years, they ought to be made a part of our building, and if not now, then when? That alone will cost about ten thousand dollars, but the value they represent in beautifying our sanctuary and forging another bond with the founders of our congregation cannot be measured. I ask that you help us to make this dream a reality, and in the coming years, to help us to improve our buildings and grounds in ways that we all can be proud of. Back in 1871, the founders of Adas Emuno started this congregation because they knew their lives would not be complete without a spiritual home. In doing so, they kept faith with a four thousand year old tradition that is continuing to evolve and adapt to changing circumstances. They built Adas Emuno for themselves, for their families, for their children. And they built it for us, for the Jewish community of the future, individuals that they would never know, living in a world that they could not possibly imagine. And we today benefit from the gift that they gave us, and the question before us is, can we be true to that gift? Can we create a home for Adas Emuno that our congregation deserves, a home that we can take pride in, and a home not just for ourselves, but for the generations that are following in our footsteps? We enjoyed another lovely Shabbat service and another full house this past Friday night, led once again by our new clergy team. And let's now introduce our new Student Cantor, Luke Hawley. Luke Hawley is currently in his final year of studies at the Hebrew Union Colllege/Jewish Institute of Religion School of Sacred Music in New York, and lives in Astoria, Queens. He grew up in Northbrook, Illinois and lived in Chicago for about twenty years after studying Art History in college. Luke studied at the Pardes Institute in Jerusalem for two years before entering HUC. Previously he had a career as systems analyst working for companies such as Motorola and Sears. For the past three years he was the student cantor for the Garden City Jewish Center in Garden City, Long Island. And with that, we issue a warm welcome to Congregation Adas Emuno for our new student cantor. We look forward to hearing your soulful sounds of spirituality throughout the coming year. 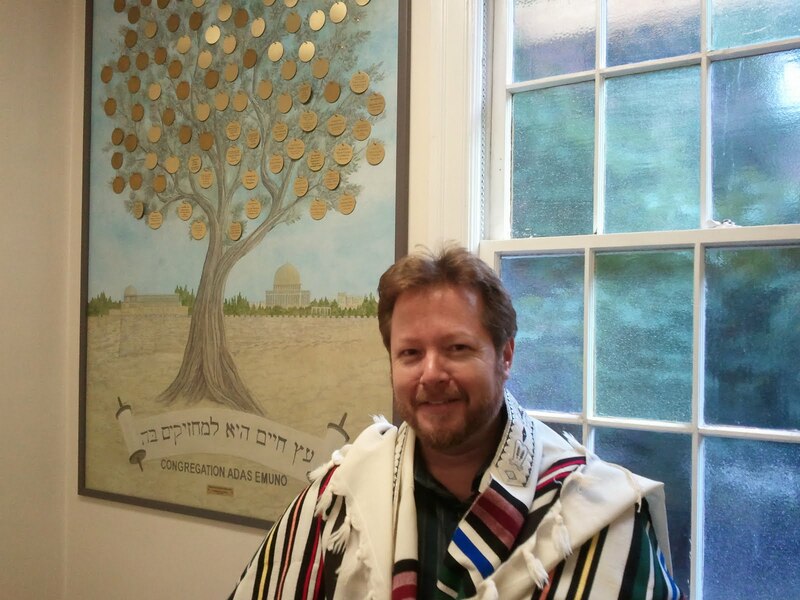 And for those of you who may have missed the profile of our new rabbi, please see our previous post: Welcome Rabbi Schwartz! Rabbi Barry Schwartz led his first Shabbat service here at Congregation Adas Emuno last Friday night, with a full house in attendance, many more than than the usual crowd that comes to pray during these hot summer months. And as an extra special treat, our new student cantor, Luke Hawley, also joined us, supplying a mix of traditional cantorial virtuosity with guitar-in-hand song-leading that rocked the house! Were you there? If you were, you witnessed the warmth and spirituality of our new rabbi as he introduced himself to our congregation in memorable fashion. And not only was his whole family present for his debut, but we also played host to a contingent of his former congregants from M'Kor Shalom in Cherry Hill, NJ, who came up to wish Rabbi Schwartz well! To be fair, there were a few stumbles along the way as our new clergy worked together for the first time, but that is only to be expected, and what came shining through was their wonderful humanity, and the marvelous kavanah, the spirituality of the heart that they both exemplify. We truly are blessed! Services were followed by a champagne oneg, hosted by Adas Emuno President Alan Spector, and as it was also his birthday, the kiddush and ha-motzi were followed by a hearty round of "Happy Birthday," to Alan and to a young visitor from Cherry Hill who was also celebrating his birthday. And what a fine birthday present for our congregation's president, brand new clergy and a packed sanctuary! And hey, if you missed services last Friday, don't worry, we're only just beginning. 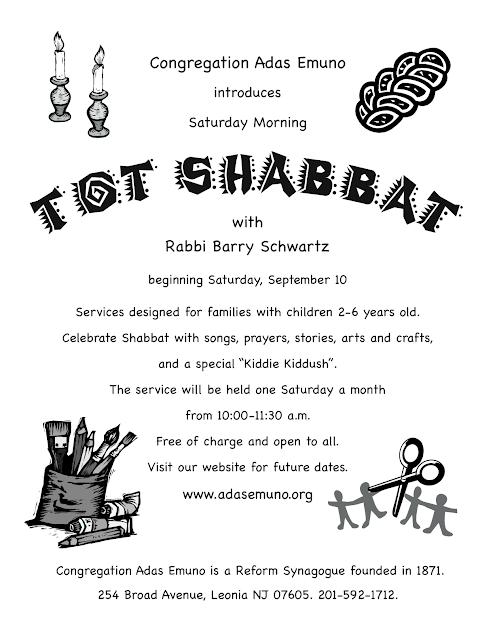 While we can't promise champagne and birthday cake every week, Rabbi Schwartz will be back with us this Friday night, and for a long time to come! So join us, please, as we embark on this new chapter in the history of Adas Emuno. For more about our new rabbi, see our previous post: Welcome Rabbi Schwartz! For more about our new cantor, keep an eye for an upcoming post profiling Luke Hawley.